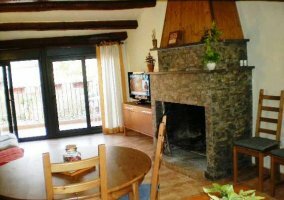 Our accommodation is located inside the urban center of Prats del Rey. Being located in the same town, it has a very rural feel reminiscent of the houses of the villages but, at the same time, it is rehabilitated and adapted to the needs that may arise now. In the house you can host 10 people. 2 rooms with double bed. A room with 2 single beds. We recommend it for a group of friends or several families. The dining room is very large and spacious. You can sit quietly in the armchairs, with the peace offered by the fireplace encendida and observing the exterior thanks to the large windows there is in this room. We also have television, DVD and a table with chairs where you can eat. We also have a living room with sofas and a little table to hang out in . The kitchen is totally new. It has all the appliances needed: dishwasher, washing machine, microwave, oven, etc. To cook you have a ceramic hob and, in addition, in this room you have another large table with chairs. In the accommodation we have a total of 2 bathrooms complete with shower. Heating in the whole house. We are at Prats del Rey. The Church of St. Mary . A building built between the seventeenth and eighteenth centuries. The style he has is the baroque. In addition you can visit the different streets of our village of 600 inhabitants or surround yourself with nature. Tower of the Manresa. It is an old watchtower, built 10 centuries ago (around the year 1000). It has a viewpoint at the top from which you can contemplate beautiful views as it is 21 m high. The dolmen of the three kings . It is located in the Sierra del Rubio. It is an old work dating from the time of a.C.
Margarita y Ramon Hello! I am the owner of this rural house, located in central Catalonia and perfectly communicated. It has capacity for 10 people, and inside it has all the comforts, and spaces to enjoy among friends. I hope to serve you as you deserve; that is my priority. It is perfect for picking mushrooms and enjoying leisure time, as it is close to an equestrian center. There are hiking trails and bikes available. We have heritage dating from Romanesque, located very close, so you can enjoy knowing the footprints that have been left. You can enjoy natural landscapes, and heritage like its churches, which are perfectly preserved.